Many people consider facial sprays or “spritzes” to be a total waste of time; I very much enjoy using them. Perhaps because I spend a lot of time at my desk, where any distraction, however brief, is a joyous one. Stopping to spray my face with something lovely can lift my spirits for at least a few minutes – the short, cool blast of freshness also helps to perk me up and stop me falling asleep with my head on the computer keyboard. I’ll be honest, a lot of facial spritzes don’t really do that much – they are simply water in a can. It may claim to be some kind of soothing, healing, special water – but it’s still just water. No added ingredients, nothing to help the skin to stay moisturised or to cool or refresh – just water that quickly evaporates, often leaving your face tighter than before! I’ve spent this summer whittling down my spray collection (must be almost one hundred different spritzes in my office) and trying to find out which ones actually do something. There’s a whole series of posts coming up, but to start with I wanted to tell you about the Pure Collagen Spritz from Face Matters, the Hyaluronic Acid Facial Mist from Episilk and the Moisture Defense Antioxidant Spray from MD Formulations. I’ve grouped these together because they are all scent-free and feel very uncomplicated, yet they really do seem to perk up my skin. If only temporarily. They are all suitable for every skin type, though particularly useful, I feel, if you have oily or acne-prone skin and want to find something moisturising but still non-greasy and lightweight. The first spray, the Pure Collagen Spritz, is from a brand called Face Matters. This is a tiny brand – there are just three products in the range that I can see – and I have to confess to knowing absolutely nothing about them. It’s one of those products that I picked out of a pile by complete fluke – I loved the simple packaging and the idea of a Collagen Spritz sounded nice and different. This spray doesn’t have any kind of residue at all, so you can spray all day without overloading your skin with product. What I would say, though, is that it does seem to almost “reactivate” my moisturiser if I use it towards the middle or end of the day. It’s like a little bit of encouragement for my skin when it’s knackered and nearing the finishing line! On the packet, the claim is that the spritz helps to “stimulate the production of collagen and elastin”; on the website, the “sciencey bit” explains that it’s the pure, natural silicon that they use in their products that does this stimulating. If you like the sound of this, then have a look on the Face Matters site for more details. The second spritz is a facial mist with pure hyaluronic acid from Episilk. Another brand that’s entirely new to me. This spray, out of nearly all of the sprays I tested, has the most noticeable moisturising effect. It’s almost like spraying on a very, very fine layer of non-greasy moisturiser. If you were ever looking for something incredibly lightweight – lighter even than a serum – to boost your hydration levels, then this would be ideal. I’m not sure which circumstances would require such a product, but it’s always good to bear these things in mind! It’s great as a pre-moisturiser boost on cleansed skin and I suppose, if you were at a festival or campsite or something and you wanted a quick blast of hydration, this would be a very useful little spritz.You can find it on Amazon here for £19.99. 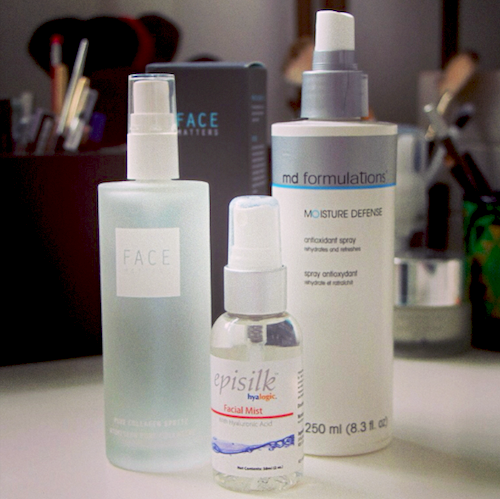 My last spritz here is a bit of a gem – the Antioxidant Spray from MD Formulations. I’m sure I’ve mentioned this one before. It rehydrates extremely well if you spray it over makeup, but I think that it truly comes into its own as a pre-moisturiser treatment. It’s more like a spray-on toner or pre-serum tonic than it is spritz – really well formulated with antioxidants and ingredients that can help to keep the skin moisturised throughout the day. It’s very soothing on skin that’s been through the mill a bit (holidays, changes to weather and so on) and it’s great if you want something non-oily that won’t feel heavy on your face. You can get the MD Formulations Moisture Defense from FeelUnique.com – it’s £27.25 for a big 250ml bottle. There are more spritzy posts coming up, but let me know your own favourites in the comments area below. If I haven’t tried them then I’ll add them to my ever-growing list.